?South Bay RV Campground is the perfect place to relax and unwind. 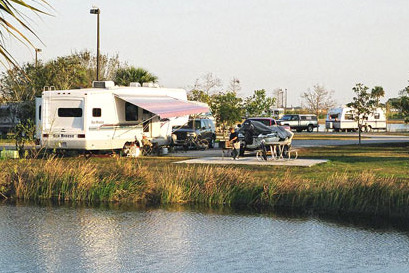 Located in South-Central Florida in the heart of sugar cane country, the campground serves as the perfect layover spot for visitors passing through or a wonderful vacation alternative to Florida’s bustling coastal areas. 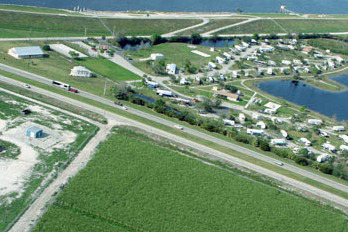 This peaceful RV park is nestled at the base of the levee on the southeast shore of Lake Okeechobee. This picturesque setting provides habitat for many of Florida’s native plants and animals including many endangered species. Fishermen and boaters enjoy easy access to Lake Okeechobee by using the boat ramp located across the street from the campground. Nature lovers enjoy hiking, biking, and bird watching on the Lake Okeechobee Scenic Trail located on top of the levee just a short stroll from the campground. This beautiful campground is the perfect place to start your exploration of the Sunshine State! Located on Big Cypress Seminole Indian Reservation and nestled in the scenic Florida Everglades. Resort owned/operated by the Florida Seminole Tribe. Grassy and paved RV sites, full hookups, tents and air-conditioned cabins. Nearby attractions include Ah-Tah-Thi-Ki Museum, Big Cypress Rodeo Grounds and Billie Swamp Safari.